The client/server information exchange in DNS is facilitated using query/response messaging. Both queries and responses have the same general format, containing up to five individual sections carrying information. Of these, two are usually found in both queries and responses: the Header section and the Question section. I will start exploring the detailed format of DNS messages by looking at these two sections; the next topic will cover the resource record formats used by servers for the other three message sections. The header is the most important part of any message, since it is where critical control fields are carried. In DNS messages, the Header section carries several key control flags, and is also where we find out which of the other sections are even being used in the message. Examining the Header can help us understand several of the nuances of how messaging works in DNS. 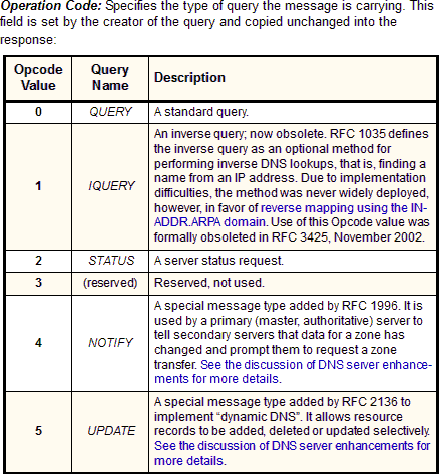 The format of the Header section used in all DNS messages is described in detail in Table 169 and shown in Figure 248. Where fields are used differently by the client and server in an exchange, I have mentioned in the table how the use is differentiated between the two. Identifier: A 16-bit identification field generated by the device that creates the DNS query. It is copied by the server into the response, so it can be used by that device to match that query to the corresponding reply received from a DNS server. This is used in a manner similar to how the Identifier field is used in many of the ICMP message types. Query/Response Flag: Differentiates between queries and responses. Set to 0 when the query is generated; changed to 1 when that query is changed to a response by a replying server. Authoritative Answer Flag: This bit is set to 1 in a response to indicate that the server that created the response is authoritative for the zone in which the domain name specified in the Question section is located. If it is 0, the response is non-authoritative. Truncation Flag: When set to 1, indicates that the message was truncated due to its length being longer than the maximum permitted for the type of transport mechanism used. TCP doesn't have a length limit for messages, while UDP messages are limited to 512 bytes, so this bit being sent usually is an indication that the message was sent using UDP and was too long to fit. The client may need to establish a TCP session to get the full message. On the other hand, if the portion truncated was part of the Additional section, it may choose not to bother. Recursion Desired: When set in a query, requests that the server receiving the query attempt to answer the query recursively, if the server supports recursive resolution. The value of this bit is not changed in the response. Recursion Available: Set to 1 or cleared to 0 in a response to indicate whether the server creating the response supports recursive queries. This can then be noted by the device that sent the query for future use. Zero: Three reserved bits set to zero. Question Count: Specifies the number of questions in the Question section of the message. Answer Record Count: Specifies the number of resource records in the Answer section of the message. Additional Record Count: Specifies the number of resource records in the Additional section of the message. Note that the current lists of valid question types, query operation codes and response codes are maintained by IANA as one of its many lists of Internet parameters. 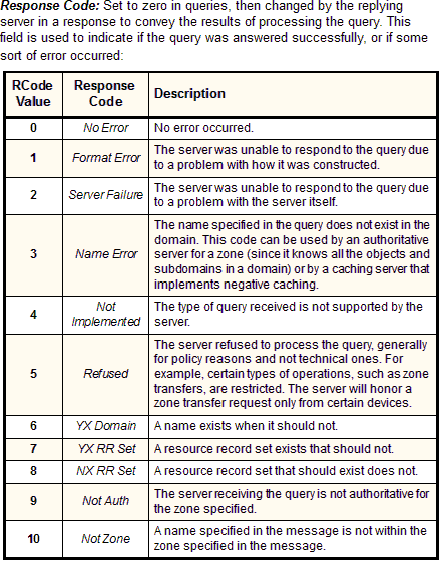 Response codes 0 to 5 are part of regular DNS and are defined in RFC 1035; codes 6 to 10 implement dynamic DNS and are defined in RFC 2136.